It’s a good day when muscle cars are reaching speeds that defined the last generation of supercars. Chevrolet makes it so that the Camaro lineup becomes a little confusing when choosing between the two top trims of the muscle car, the Z/28 or the ZL1. Out of the two, the Z/28 is the track bred car, gaining aerodynamic bits to help it stick to the tarmac. Cars like the Dodge Viper ACR are hindered by those kinds of aerodynamic modifications, capping the Viper off at 177 mph. The ZL1 on the other hand, is where the horsepower festival of the two Camaros is at and it has just returned from Germany after setting a new record. The General took a stock example of Chevy’s ZL1 equipped with the new ten-speed automatic transmission to Germany’s Papenburg High Speed Oval, essentially a 7.6 mile loop with two 2.5 mile straights and two 1.3 mile turns that are banked, allowing for test drivers to keep the throttle to the firewall through the long corner. The test was conducted in both directions to account for wind speed and the team managed to attain 202.3 mph in one direction and 193.3 mph in the other. Averaged out, this means that the ZL1 has a top speed of 198 mph, just two mph shy of the 200 mph mark making it the fastest Camaro to ever come out of the factory. 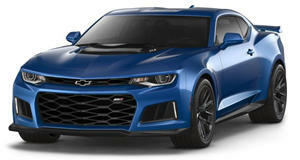 “The ZL1 was developed with high-speed performance in mind, incorporating a balanced aerodynamic package that reduces lift without significantly affecting drag,” said Al Oppenheiser, chief engineer for the Camaro. Most impressive is the fact that, aside from the data logging equipment and mandatory safety equipment, the ZL1 was bone stock. The only change made was to the air pressure in the Goodyear Eagle F1 Supercar 3 tires, which were set to the 44 psi recommended for top speed performance runs. Suspension tweaks seem to have enabled additional speed, as claimed by Oppenheiser, but they render the car a modified vehicle. “After testing the car in standard settings, which produced the 198-mph average, we set the front and rear camber adjustments to 0 degrees and the tire pressures to the maximum allowable sidewall pressure, and saw the ZL1 average over 200 mph,” said Oppenheiser. This means that it’s possible to have a 200 mph car for the low price of $65,830 (for the ten-speed automatic coupe, $63,435 for the six-speed manual coupe), which also gets you a 3.5 second 0-60 mph time, a 1.02 G cornering max, and a 11.4 second quarter mile at 127 mph, all thanks to the 650 horsepower supercharged V8. Suffice it to say, American muscle is growing out of its adolescent years.